Construction is a dangerous industry to work in. The Occupational Safety and Health Administration (OSHA) reports that one in five worker deaths in 2016 were construction-related, and more than half of those deaths can be attributed to four specific causes. OSHA has labeled these causes the “Fatal Four”, and the group suggests that up to 631 worker’s lives could be spared every year though eliminating the final four. OSHA’s Focus Four or Fatal Four list includes falls, struck by an object, electrocutions, and caught-in or between. These four causes were responsible for 56 percent of construction-related fatalities in 2010 and 63 percent in 2016. Fall hazards include any exposure to a worksite condition that reduces balance and increases the likelihood of a fall. Electrocution occurs when construction workers are exposed to electrical energy in lethal amounts. Struck-by hazards include all incidents where the worker collides with a moving object. Caught-in or between hazards involve trenching, getting caught in machinery or getting stuck between other objects. Overall, OSHA has been successful in reducing the total amount of workplace fatalities. Despite the agency’s progress, hundreds are severely injured or killed every year while working in this industry. When you’ve suffered a job-related injury, you are entitled to workers’ compensation benefits. In addition, injured parties may decide to bring a personal injury lawsuit against their employer for additional compensation. 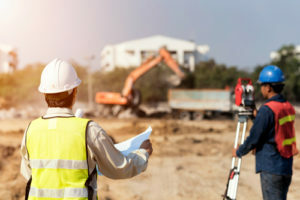 The construction accident attorneys at Hoyt & Hoyt work alongside engineers, heavy equipment specialists, construction safety experts and accident reconstruction specialists to ensure that you receive the maximum amount of compensation for your injuries. If you’ve been injured at a construction site, then contact the lawyers at Hoyt & Hoyt now at 973-292-2299.